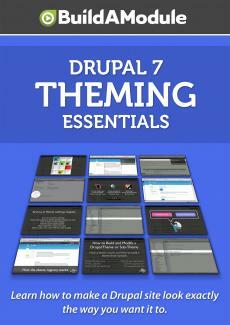 I'm Chris Shattuck and the is Import Drupal Theming Concepts. In this video we're going to talk about methods of modifying Drupal output. We'll look at how to decide which methods to use when and how to track down the source of the output. At first glance, it might seem like a series of videos on theming in Drupal is a bit outside of the scope of building a module which is the core function of this site. However a lot of the people who are building modules, possibly yourself, are doing so in order to provide some custom functionality for a specific site or a series of specific sites rather than building a module for the purpose of contributing it back to Drupal and sharing that. Because of that there is a huge set of skills and techniques that you can learn in order to be able to get what you are looking for without having to use too much code and making sure as you go through the process to put your code in your modifications in the right place.